On Bank Holiday Monday the Bristol Pegasus Motor Club ran it’s Wessex Sprint at the Hullavington airfield, normally a site open to the public, today’s random selection of photographs were taken in between keeping the perimeter road free of dangerous mowing tractors, cyclists, joggers and dog walkers. 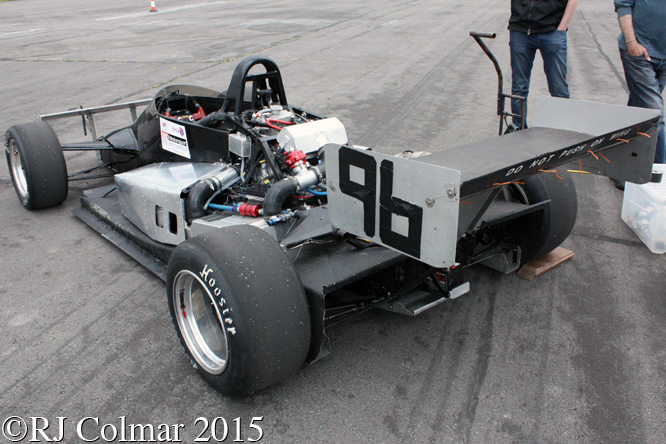 It was a thrill to finally catch sight of Dave Cutcliffe’s much modified Formula Ford Van Diemen DC 93 M which is powered by a turbocharged motor cycle engine, Dave was disappointed to be a second off fastest time of the day, but given he had an ECU fault in the morning had to settle for fastest in the top racing car class. 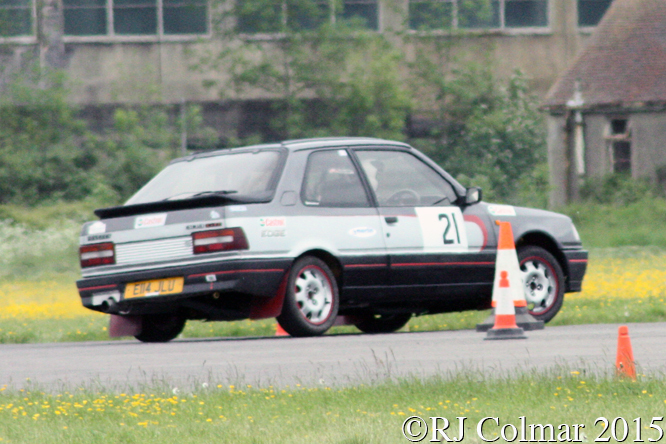 Ray Sissins from nearby Devizes is seen above negotiating the second chicane in his 1987 #21 Peugeot 309 GTi. 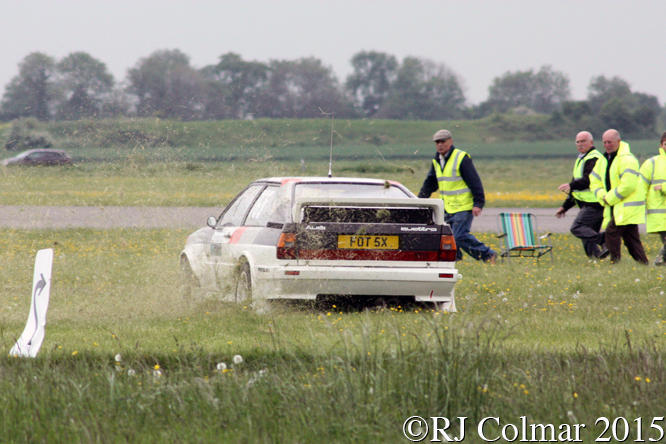 Andy Traynor celebrated what would turn out to be the fastest time in his class with 11 seconds of lawn mowing before the second chicane on his final run of the day in the Audi Quattro he shares with Tim Clarke. 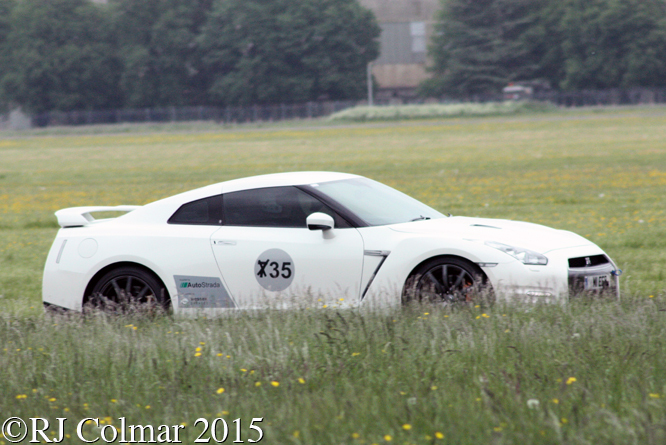 Andrew and Robert James brought their Nissan GTR all the way over from Bridgend and secured the top two spots in the top Road Going Production Class with Robert pipping Andrew seen above running the #35. 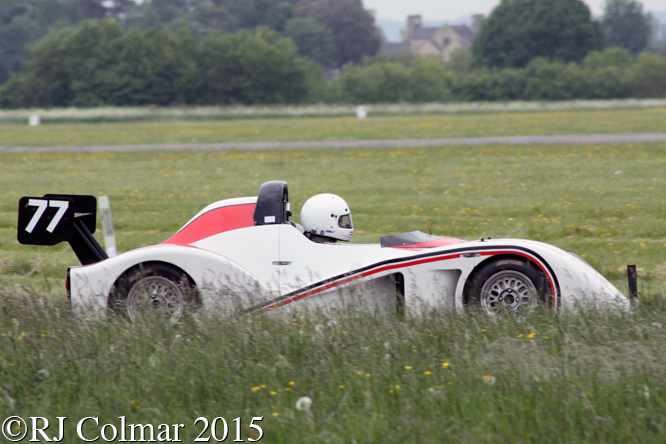 2nd in the Sports Libre Class was Stewart Lillington seen above driving the #77 Radical SR4. Regular readers might remember blogs about Jeremy Hawkes MG J2 and MG K3, he also runs this #91 Hawke DL16 thanks to his Dad who helped him out with the costs towards the engine and gearbox. Jeremy is particularly keen to hear from any one who has a photo or photo’s of Jan Lammers driving a #36 Hawke to a 19th place finish in the B.R.D.C. Vandervell British F3 Championship at Donington Park on the 27th of August 1977, chime in below if you can help. Thanks for joining me on this “Securing The Boondocks” edition of “Gettin’ a li’l psycho on tyres” I hope you will join me again tomorrow when I’ll be returning to this month’s Le Mans series. Don’t forget to come back now ! 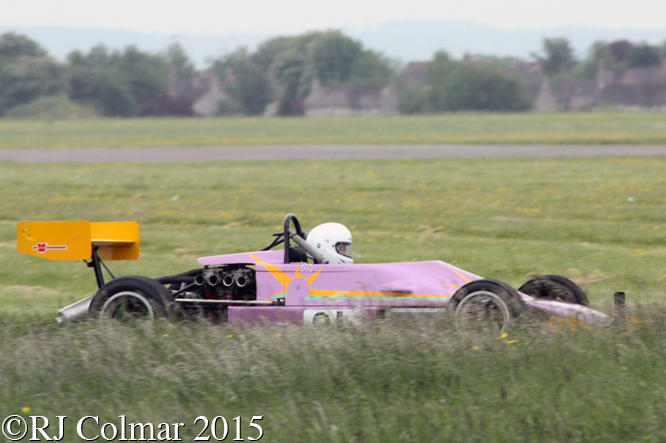 This entry was posted in Uncategorized and tagged Audi, Bristol, Clarke, Club, Colmar, Cutcliffe, Hawke, Hullavington, James, Lillington, Motor, Nissan, Pegasus, Peugeot, Psychoontyres, Radical, Ralph, Sissins, Sprint, Traynor, Van Diemen, Wessex on June 3, 2015 by Ralph. 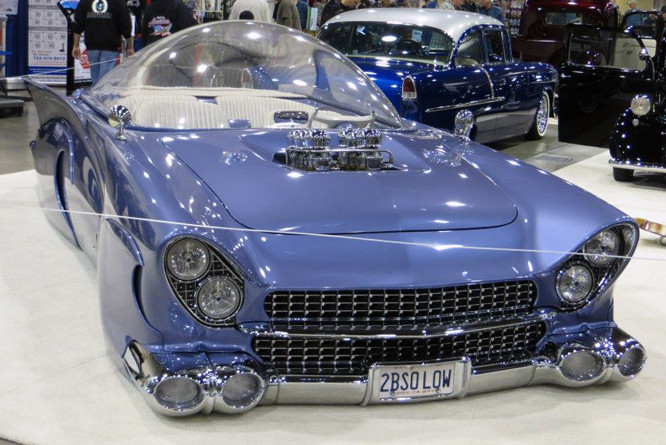 Congratufreakinlations® – Grand National Roadster Show. 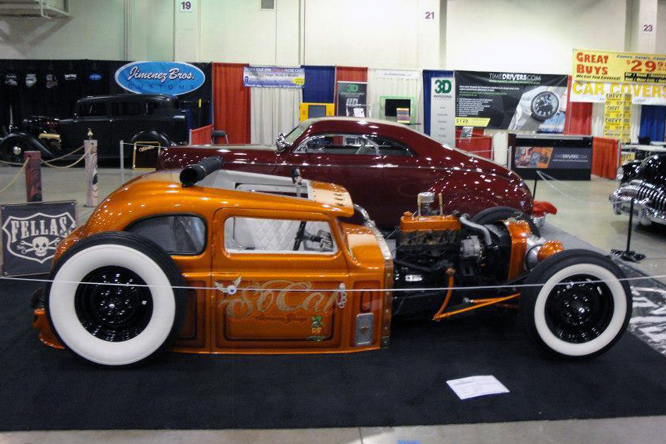 The last week of January saw neighbours Gary L Wales and Johnny Martinez attend the 64th Grand National Roadster Show at the Fairplex in Panoma, California. Johnny Martinez has kindly agreed to share his photographs of the event with us today. 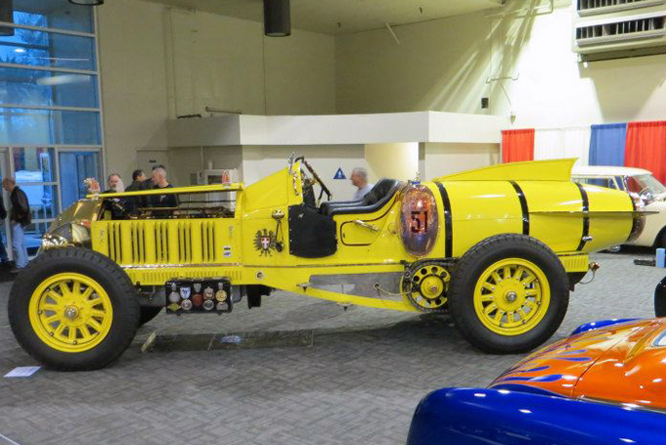 Gary L Wales was showing his 1919 American La France based La Bestioni V, the chains of which are spun by a 14 litre / 854 cui 6 cylinder motor. Gary was awarded the Novelty Vehicle Trophy for his creation. The Queens Last Revenge a triumph of the art of low riding. I’m sure this colour green would not have been available in 1932 when this Ford was originally built but it is nicely set off by the white soft top panel in the roof. So Cal so low some of us might need the sun roof to see where we are going. Jesse James and his West Coast Choppers is probably as well known in this country for yomping across Lord March’s Goodwood Estate in his Trophy Truck as he is in the USA for his television show’s which include Monster Garage in which this 1950 Ford Woody was resurrected, I love the old school 1/4 mile dirt track style bumper on the front. 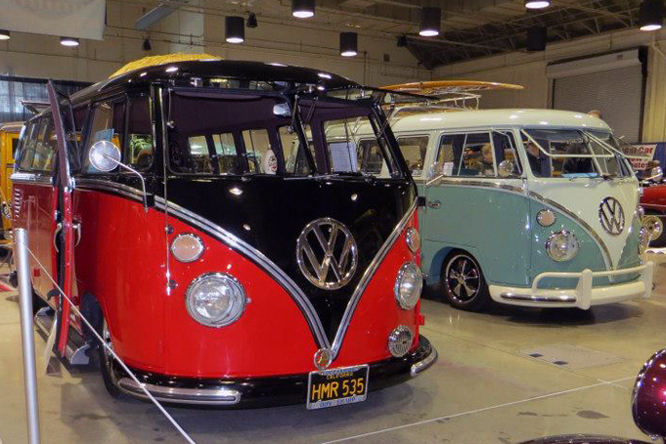 While California is by no means the home of surfing it is associated with much surfing activity so the presence of a couple of split screen Volkswagen Type 2 campers can be no surprise, these two appear to date from somewhere around 1964. 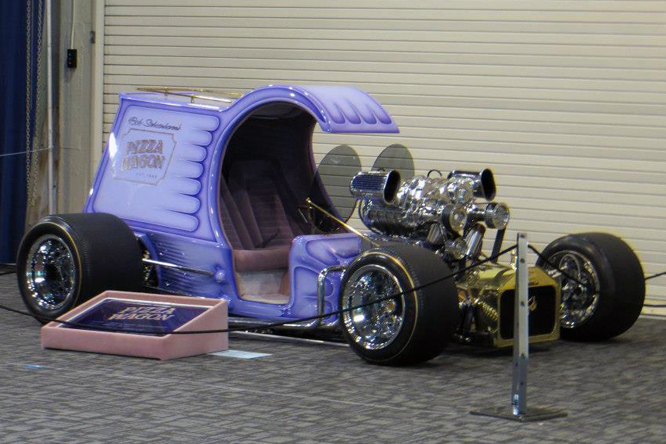 It’s not every day I see a Pizza Wagon with two Rootes Superchargers and outsize slick tyres, this example is billed as a 1919 Ford C Cab and was built by Bob Schoonhoven and is said to feature Dan Wood suspension, unfortunately the Pizza Van is a show car and not street legal. Johnny reckons the Cruel Intentions Chevrolet Impala convertible above is probably the only car you would get away with displaying upside down. 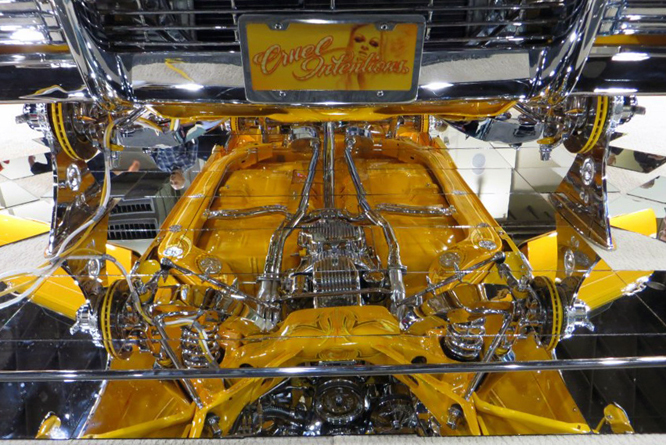 The curious amalgam of Johnny “Lunchbox” Cash parts above started life as a 1955 Ford and sits on a 1988 Lincoln Town Car chassis. 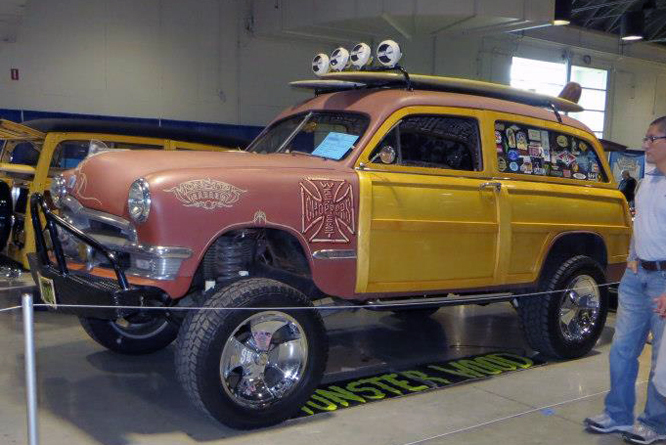 2BSOLOW is also known as a 1955 Ford Beatnick Custom it was built by Gary “Chopit” Fioto as a tribute to Kustom pioneers Ed “Big Daddy” Roth and Darryl Starbird. The the 350 cui Chevrolet powered Bubble Top has won numerous awards and was recently estimated to be worth a high $125,000 at auction in 2011, but did not sell. 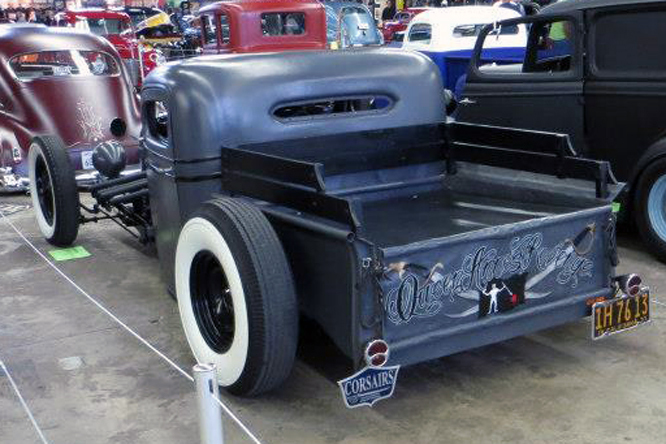 Finally we come to Johnny’s ’29 Ford Model A pickup which I featured a couple of weeks ago. After four months of meticulous preparation Johnny is seen here with the Rod Pickup – pre-1935 award which he won at the show, as his friend Merritt Sanger trade marked on facebook “Congratufreakinlations®”. But that is not quite the end of Johnny’s story as some of you will remember I spent a couple of weeks at the end of last month to vote for Johnny’s ’29 Ford Model A pickup in the Gold Eagle Cool Ride of the Month contest. 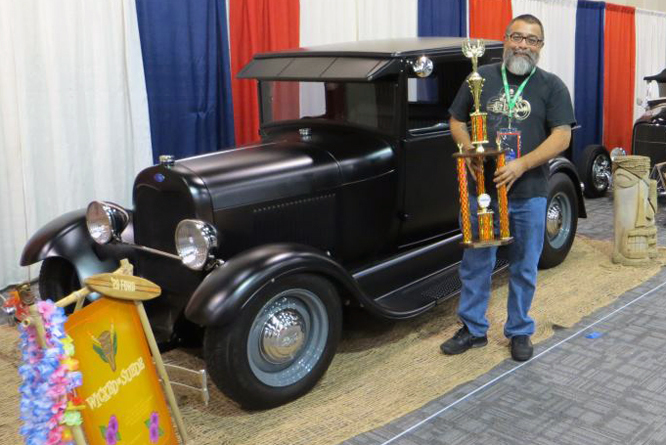 After a close fought battle with daily swings of less than 1% making the difference in the lead over several weeks Johnny’s friends including several GALPOT readers finally pushed his ’29 Ford clear on the last day to win the 2013 January Gold Eagle Cool Rides on line contest by just over 1%. On behalf of Johnny I’d like to thank every one who participated. 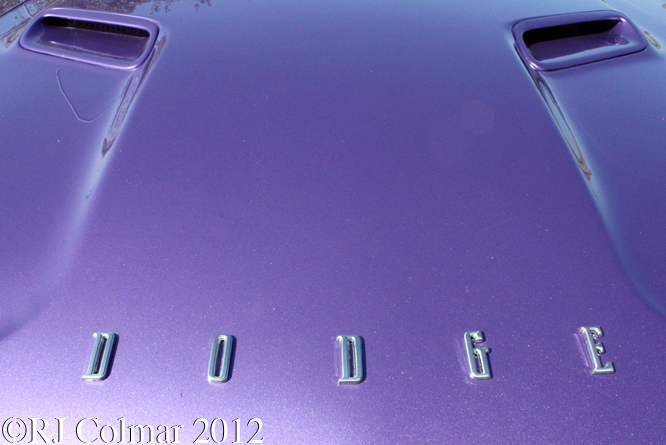 Johnny will be receiving a $150 dollars worth of Gold Eagle products to help him keep his Pickup in top condition. Johnny’s Ford has now won 28 awards in 31 months. 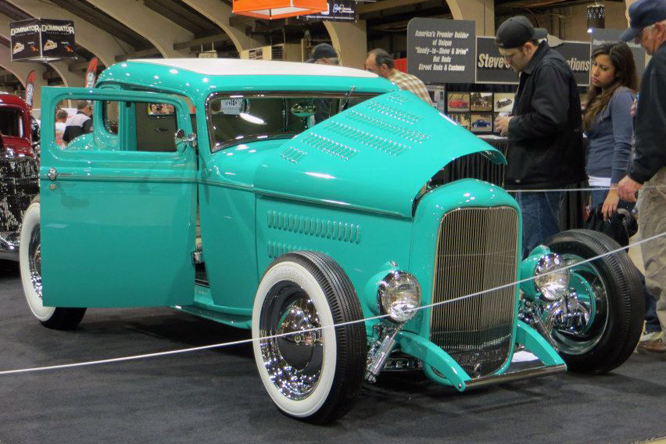 My thanks to Johnny Martinez for sharing his photo’s from the Grand National Roadster Show and congratulations again on another two well deserved wins. Thanks for joining me on this “Congratufreakinlations®” edition of “Gettin’ a li’l psycho on tyres” I hope you will join me again tomorrow. Don’t forget to come back now ! 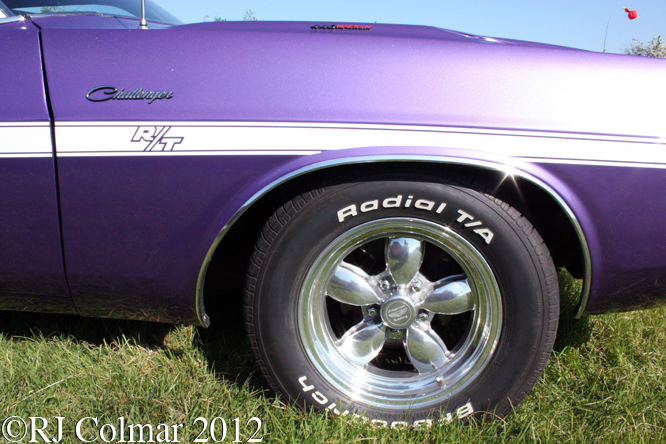 This entry was posted in Uncategorized and tagged CA, Chevrolet, Colmar, Cruel Intentions, Fairplex, Ford, Ford Beatnick Custom, Ford C Cab, GALPOT, Grand National Roadster Show, James, La Bestioni V, Martinez, Monster Garage, Panoma, Pizza Wagon, Queens Last Revenge, Ralph, Sanger, Schoonhoven, So Cal, Volkswagen, Wales, West Coast Choppers, Wood on February 13, 2013 by Ralph. The Spy Who Loved Me is a 1977 action thriller staring Roger Moore as British Agent James Bond alias 007 and Barbra Bach as Anya Amasova, alias Agent Triple X from the KGB, who investigate the disappearance of British and Russian nuclear armed submarines. James and Anya find themselves pursuing the reclusive megalomaniac Karl Stromberg played by Curd Jürgens in a film that was shot on location in Egypt, Italy and the Bahamas. 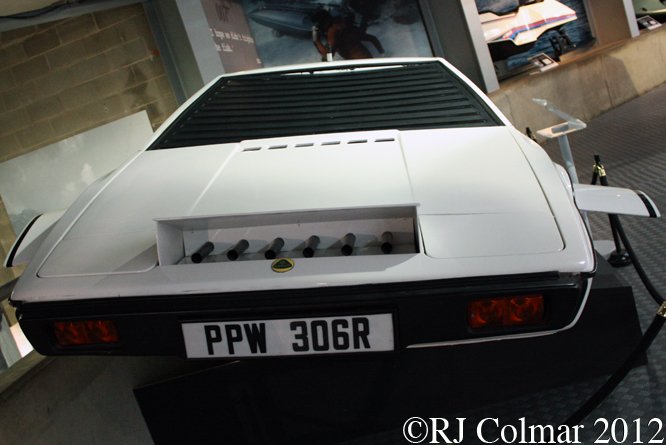 For this film Q the man with the unenviable of task of supplying toys to help 007 keep an edge on his dastardly rivals kits out a Lotus Esprit Series I, without the ears, with a myriad of gadgets and capabilities that include missiles, cement dispensers and submersible capabilities as required by the plot. The submersible Esprit seen in The Spy Who Loved Me was known as Wet Nellie and was built by midget sub specialist Perry Submarines in Florida. It was capable of 15 knots but for some reason the motors were not reversible which made controlling the vehicle somewhat precarious. Thanks for joining me on this “The Spy Who Loved Me” edition of “Getting’ a li’l psycho on tyres” I hope you will join me again tomorrow. Don’t forget to come back now ! 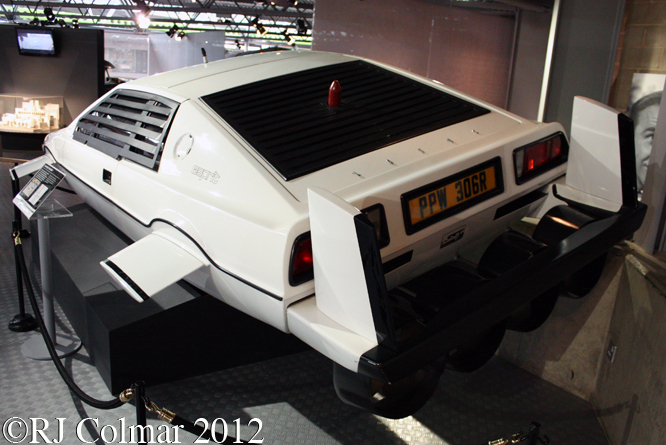 This entry was posted in Uncategorized and tagged #007, Amasova, Anya, Beaulieu, Bond, Colmar, Esprit, GALPOT, James, Karl, Lotus, Loved, Me, Motor, Museum, National, Nellie, Perry, Ralph, Spy, Stromberg, Submarines, The, Wet, Who on January 12, 2013 by Ralph. The first piece of music to make the hair on the back of my neck stand on end was by James Marshall Hendrix, some time in 1967 I was home alone during the day time so it was probably during the Easter holidays, I was messing about with some extremely uncomfortable ex military bakerlite head phones when the announcer on the radio told us that coming next would be Jimi Hendrix latest hit “Purple Haze”. I unplugged and took off the headphones and turned up the volume control of the radiogram a little in anticipation of something interesting happening. This Tomorrow Or The End Of Time theme is revisited in the 1971 flash back road movie “Vanishing Point” which begins with an all American anti hero Kowolski driving a white 1970 Dodge Challenger R/T 440 Magnum pulling back from a 90 mph impact with a couple of Catepillar bulldozers, that serve as a makeshift police roadblock and vanishing into thin air, before retelling the story of how Kowolski got to the point of staring tomorrow or the end of time in the face. 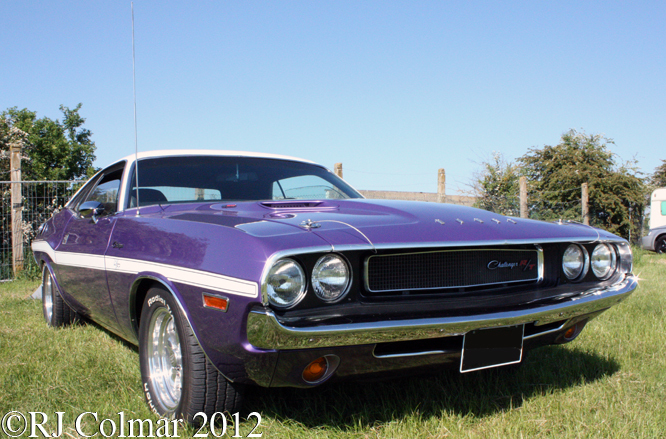 While reading up on the history of the Challenger I was interested to learn that the very first Challenger was actually a limited edition two door body called the Dodge Silver Challenger that was only available in in silver and came fully loaded with premium white wall tyres, full wheel covers, electric windscreen wipers, luxury fabric interior and deep pile carpets through out. 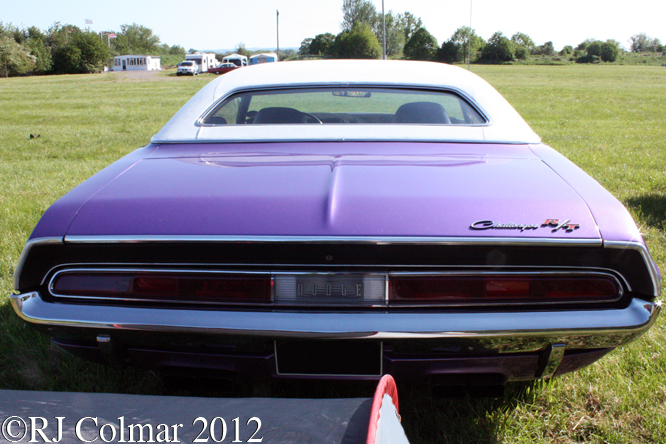 For 1970 Carl Cameron came up with the exterior design for the second generation Challenger, like the Plum Crazy FC-7 1970 example seen here at Shakespeare County Raceway earlier this year. 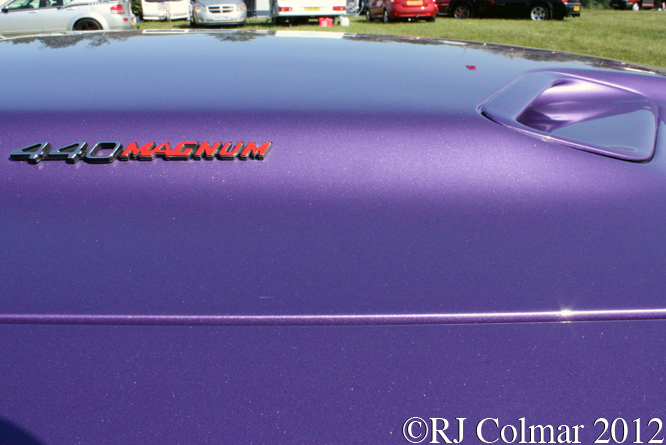 Chrysler had determined that the similar but shorter Plymouth Barracuda should belatedly compete with the Mustang and Camaro and the Dodge Challenger should compete with the Mercury Cougar and Pontiac Firebird in the pony car market. 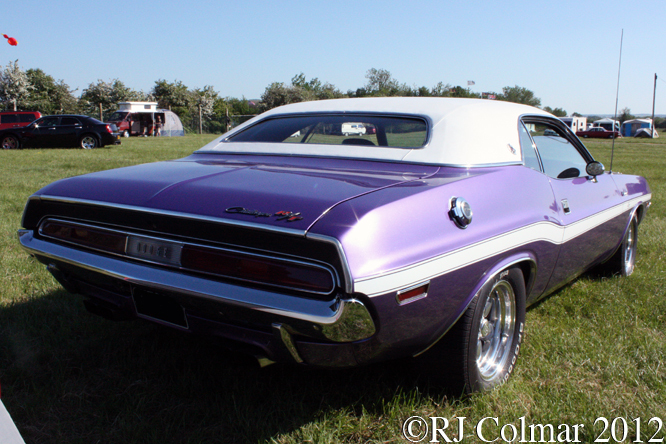 Of the engine options available to Challenger customers there were two 440 cui / 7.2 litre Magnum options one 375 hp with a single four barrel carburetor and one 395 hp with three x two barrel carburetors known as the six pack. 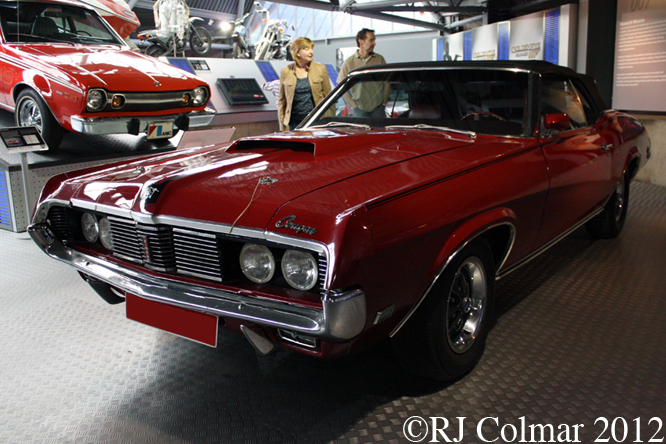 The car seen here appears to be the 375 hp option as distinguished by the air scoop which on the more powerful six pack models sits on top of the carburetor intakes in the center of the bonnet hood. Because of low sales volumes of the larger engine Challengers they have become extremely collectable, especially if the engine and chassis numbers match the original factory records. 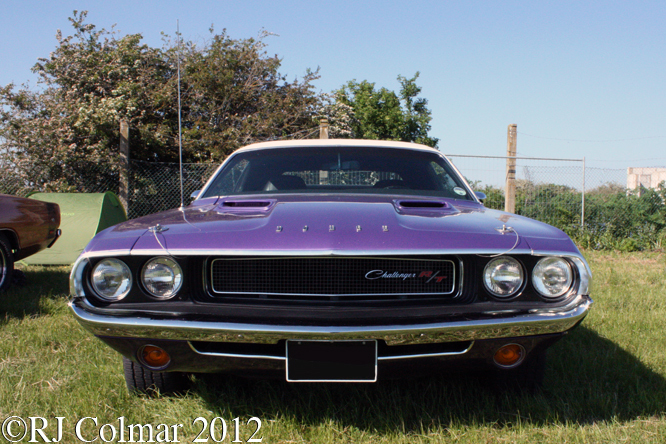 Within the pony car segment this late arrival did well to sell 76,935 copies in 1970 after which sales plummeted to less than 30,000 a year until the model was discontinued in 1974. Attractive though the Mustangs and Camaros are for my money the Challenger is the most desirable of all the muscle pony cars, there is something about it’s lines that are simply a little less fussy, a little smoother and more refined that look a bit further forward than all the others seen on pony cars in my humble opinion. 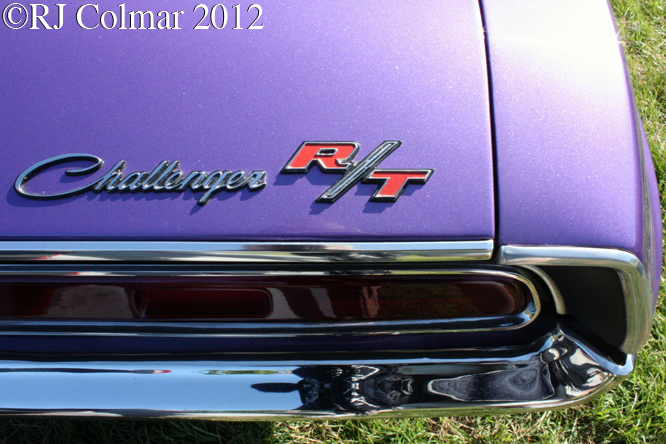 The Challenger R/T with the 440 Magnum as seen here and in the original 1971 version of Vanishing point was capable of covering a quarter mile in 13.8 seconds by which time it would be touching 102 mph, the 440 Magnum was only listed for the 1970 model year though it was available as a special order in 1971. When Kowolski approached the point of no return at the end of Vanishing Point he had a choice to turn back and see what the tomorrow would bring or to keep going further and faster into oblivion, giving up the struggle of life, forgetting not to let a few bad moments spoil a bunch of good ones and disappear into the end of time. I guess if you don’t know what happened next you’ll just have to see the film for your self to find out. Thanks for joining me on this “Tomorrow Or The End Of Time” edition of “Gettin’ a li’l psycho on tyres” I hope you’ll join me for Ferrari Friday tomorrow. Don’t forget to come back now. This entry was posted in Uncategorized and tagged 440, Cameron, Car, Challenger, Colmar, County, Crazy, Dodge, GALPOT, Hendrix, James, Kowolski, Magnum, Marshall, Plum, Point, Pony, Raceway, Ralph, RT, Shakespeare, Vanishing on November 15, 2012 by Ralph. Today’s Continental Curiosity is yet another 2 cylinder from France. 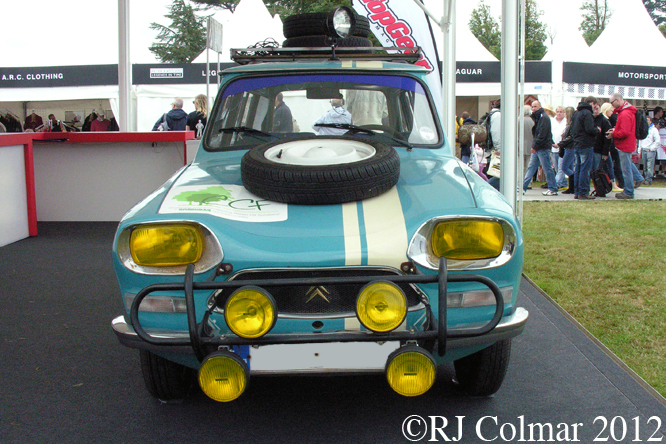 Based on the chassis and upgraded mechanical running gear of the utilitarian Citroén 2CV the slightly less utilitarian and rustic Ami was launched in the Spring of 1961 with the more powerful 22 hp flat 2 motor that was an option only on the 2CV which it was eventually intended to replace. Despite poor initial sales due to it’s lack of refinements after a series of upgrades which included rear sliding windows and an increase to 32 hp for the two cylinder models sales eventually overtook those of the 2CV and the Ami topped the sales charts in France for several years. 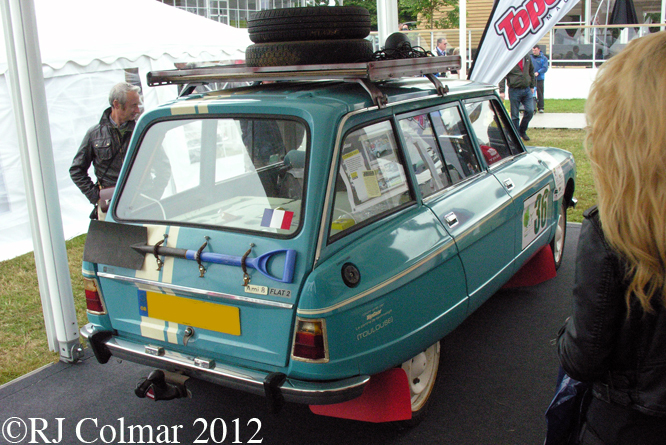 There was a more powerful 4 cylinder Ami Super which was described as a ‘Q car par excellence’ by one British Magazine, however French Tax regulations combined with it’s utilitarian underpinnings did not result in significant additional sales of the Ami Super. A further prototype Ami M35 Coupé series was also built in limited numbers for preferential customers powered by a single rotary Comotor Wankel engine. This particular 1976 Ami seen at Goodwood Festival of Speed nick named “The Love Boat” was acquired by present owner and Top Gear presenter James May, who allegedly ‘competed’ in a Majorcan Classic Rally with glamour model Madison Welch in the co drivers seat. 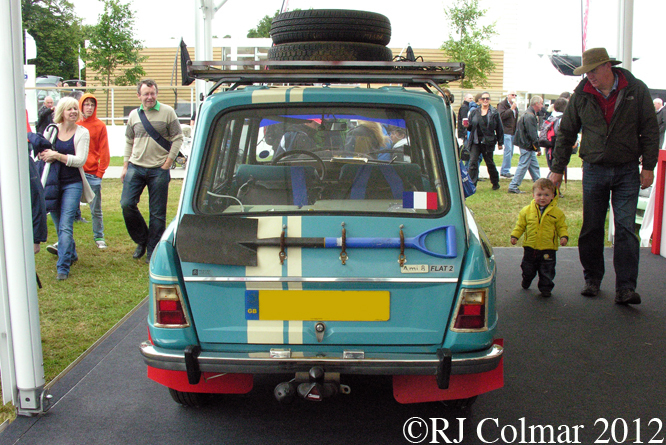 Production of the Ami spread from France to Spain and Argentina, with Complete Knock Down kits also assembled in Africa and Chile with world wide sales topping 1.8 million when production came to an end in 1978. The Citroén 2CV, on which the Ami was based and which the Ami was intended to replace, continued in production until 1990. Thanks for joining me on this “The Love Boat” edition of “Gettin’ a li’l psycho on tyres”, I hope you will join me again tomorrow. Don’t forget to come back now ! 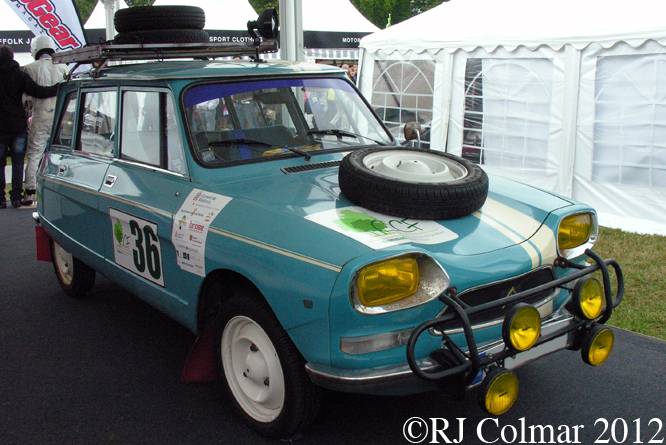 This entry was posted in Uncategorized and tagged 2CV, 8, Ami, Boat, Citroen, Classic, Colmar, Festival, GALPOT, Goodwood, James, Love, Madeline, Majorca, May, of, Rally, Ralph, Speed, The, Welch on July 18, 2012 by Ralph. To celebrate the 60th anniversary of Beaulieu opening as a visitor attraction, 50th anniversary of the Bond franchise and 40th anniversary of the National Motor Museum “Bond in Motion” is an exhibition of 50 vehicles from the James Bond franchise films at Beaulieu National Motor Museum which I visited last month. Here are seven of my favourites from the exhibition. 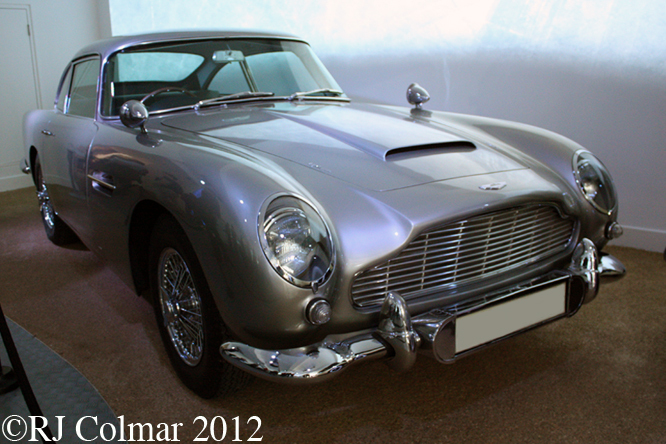 The first Bond car I can remember was the Aston Martin DB5 in Goldfinger which featured swivelling number plates for overseas duty, a passenger ejector seat for unwelcome guests, forward machine guns, rear bulletproof shield, smoke screen and oil slick dispensed from the rear light clusters, evil tyre scythe in the rear hubs for puncturing enemy tyres, radio telephone and a Sony route finder with which to track enemy movements. Despite the usefulness of all these gadgets the car came to a sad end crashing into a wall of a factory belonging to Bond’s foe Mr Goldfinger. The special effects won Goldfinger an Oscar in 1965. George Lazenby replaced the quintessential Sean Connery in the role of Bond in “On Her Majesties Secret Service” after a ski chase Bond jumps into a car driven by his amour Contessa Teresa “Tracy” di Vicenzo played by Diana Rigg who drives the Mercury XR7 through the gates of an ice racing event in her attempt to get away from Blofeld and his henchmen. This is the film in which James Bond finally get’s hitched, though not without a tragic ending. Roger Moore took over the role of Bond after a final reprise by Connery in “Moonraker”. The debonair Moore’s first appearance in the role of Bond was in “Live and Let Die” which featured numerous boat chases. 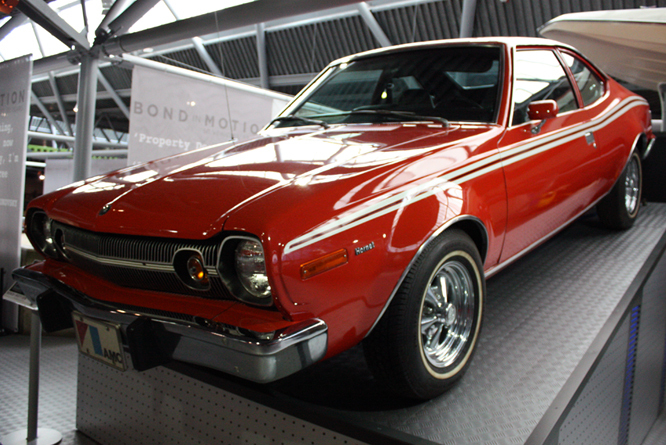 Moore’s second Bond role was in “The Man With The Golden Gun” in which Bond commandeers an AMC Hornet from an AMC showroom in Bankok and with Sherrif J.W.Pepper in the passenger seat the car executes a 360 barrel role over a sunken bridge. This is said to be the first ever stunt to be calculated with the aid of computer modelling and was performed in a single eight camera take by the uncredited stunt man “Bumps” Willard. 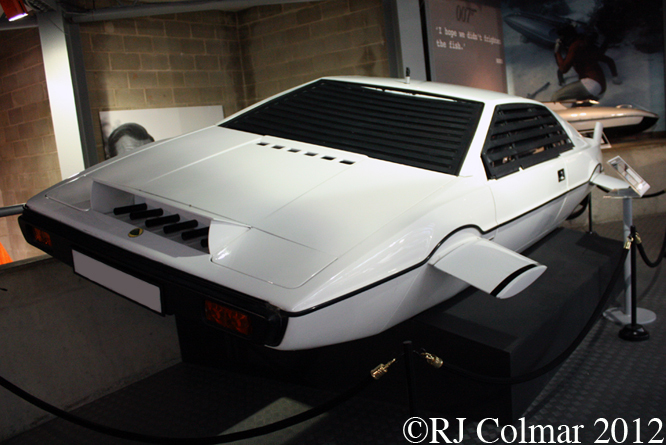 Secret Service Quartermaster ‘Q’ issues Commander Bond, still played by Roger Moore, with a Lotus Esprit for the film “The Spy Who Loved Me“. The Esprit, known as ‘Wet Nellie’, is equipped with a surface to air missile, torpedoes, cement sprayer, rear mounted ink jet, mine launcher, periscope and is convertible for submersible amphibious operations. Moving forward a decade to 1987 and the fifteenth Bond film saw Timothy Dalton take over the role of Bond in “The Living Daylights“. His Aston Martin V8 Volante is equipped with optional extra twin heat seeking missiles, jet booster engine, ice tyres and retractable ski’s which come in handy during a getaway sequence in Bratislava. “Tomorrow Never Dies” released in 1997 saw Pierce Brosnan playing the role of Bond for the second time. 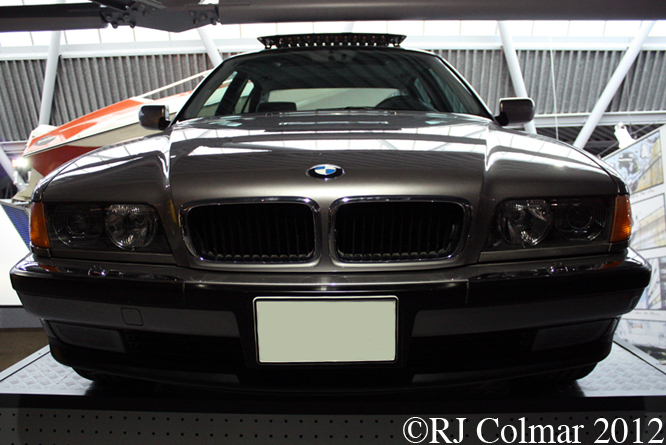 By now Bond drives a somewhat unlikely bullet and fire proof BMW 750iL which is armed with high voltage security system, missiles mounted in the sunroof, grenades, wire cutting bonnet badge and conventional, for Bond, smoke and tear gas jets and can be controlled remotely from a cell phone. The car comes to a premature end in an Avis showroom. 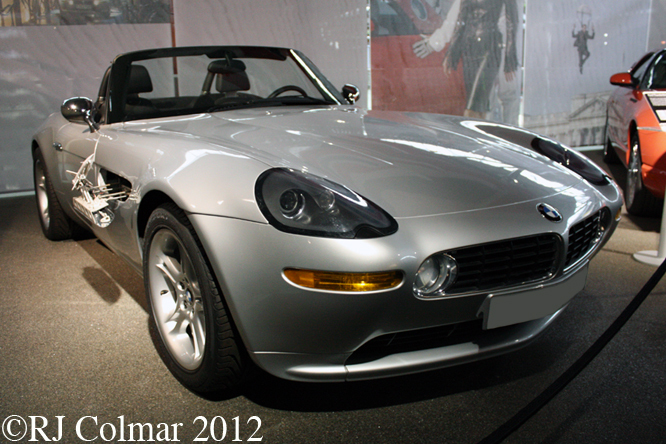 Th final car in this brief overview of the Bond in Motion exhibition at Beaulieu National Motor Museum is the BMW Z8 which featured in the 1999 release “The World Is Not Enough“. 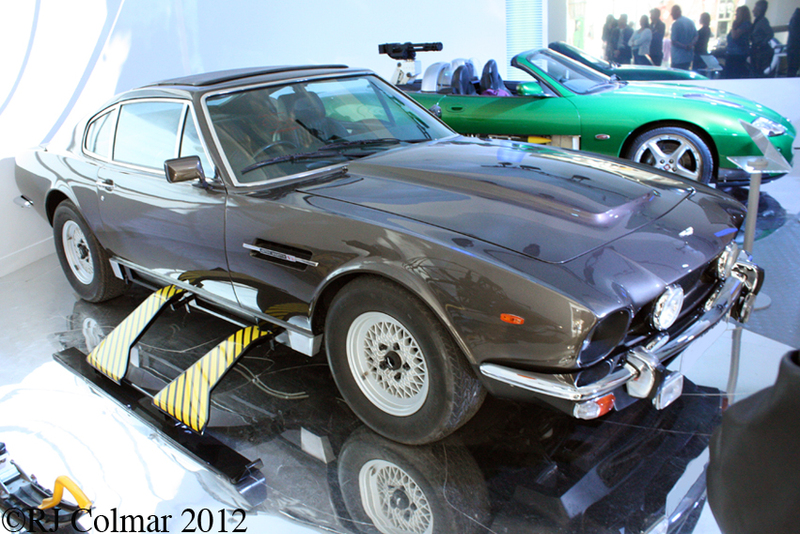 Pierce Brosnan’s Bond features remote control pads in the ignition key, bullet proof windscreen and radar guided Stinger missiles “AND six beverage cup holders”. The car meets it’s match in the form of a helicopter rotor blade which slices the car in half. Thanks for joining me on this “007 @ Beaulieu” edition of “Gettin’ a li’l psycho on tyres” I hope you will join me again tomorrow when I’ll be revisiting Queens Square for Coffee & Croissant with the Avenue Drivers Club. Don’t forget to come back now ! This entry was posted in Uncategorized and tagged AMC, Aston, Beaulieu, BMW, Bond, Colmar, GALPOT, In, James, Lotus, Martin, Mercury, Motion, Ralph on June 17, 2012 by Ralph. 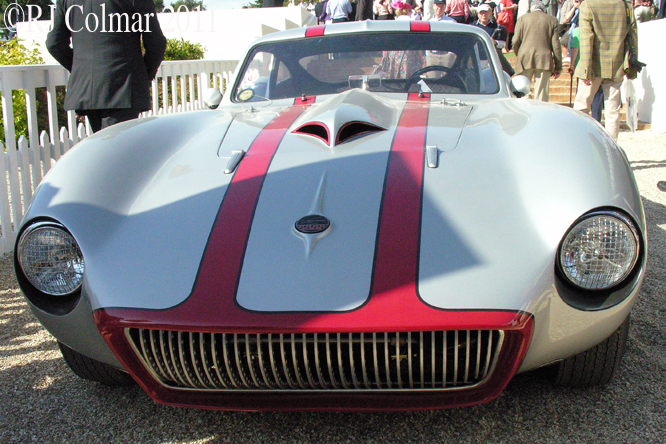 According to Griff Borgeson writing in Sports Car Illustrated in May 1960 when the Kellison J4 Grand Turismo was shown at the Los Angeles International Motorshow in December 1959 one ‘hipster’ summed up the audiences reaction by quipping ‘That is the very Wildest’. 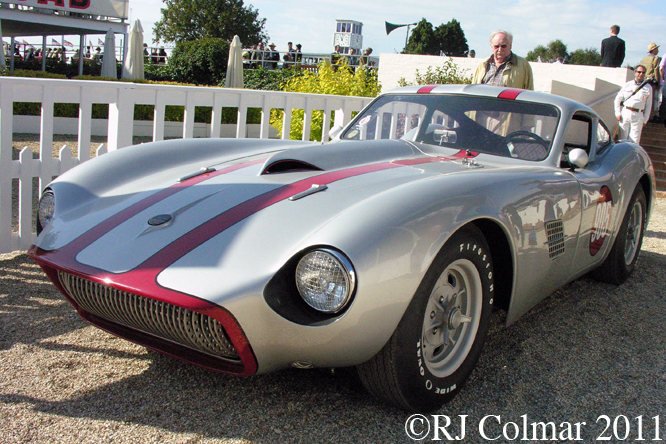 Developed by former Korean Air Force Vet and missile engineer James Kellison, at just 39 inches tall and 67 inches wide the Coupé was also one of the lowest and widest cars present. James opened a repair shop to generate the cash to turn his design into a kit car that could be built in around 130 hours. 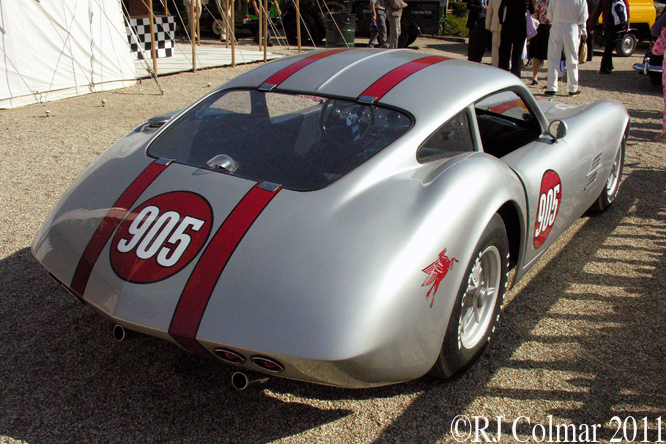 The 160lb fibre glass body was designed to fit either a salvage yard chassis or a bespoke 140lb chassis designed by stress engineer Chuck Manning. The sales literature advised potential customers that the $6700 Kellison with independent suspension, custom finished interior and luggage space for three large suitcases was a luxurious touring car and the first American car to surpass Europe’s most distinguished designs. 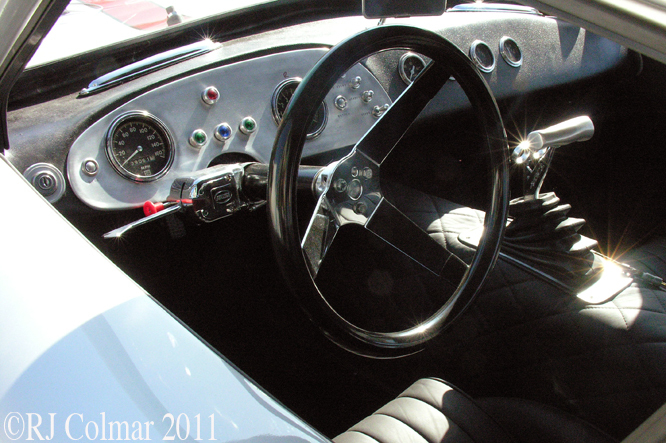 The cockpit was designed to comfortably seat a 5′ 8″ driver and passenger, though the construction of the seats was left to individual builders so that taller drivers could find away to accommodate themselves. 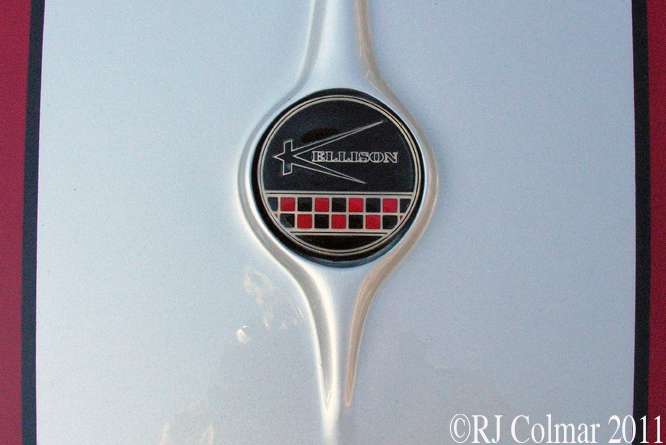 The Kellison could take any of the available V8’s of the day including the Ford, Chevy and Chrysler’s other proprietary parts included the windscreen that came from early 1950’s Studebaker Commander or Champion models, a rear screen from a 1949 Buick, Oldsmobile or Cadillac and door hinges that came from Mopar vehicles dated ’49 to ’52. 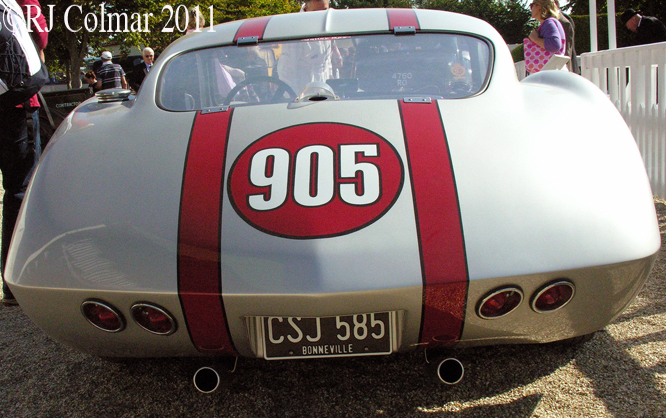 Kellison sent several vehicles to Bonneville Speed Week over the years all painted silver with maroon stripes and the #905, taken from his address ‘905-907 Sutter Street, Folsom California. One of his later J5 models is said to have recorded a top speed of 186 mph. This particular model, in need of a pair of windscreen wipers, seen at the recent Goodwood Revival apparently has recently been acquired by Lord March. More on the Kellison Marque can be found at kellisoncars.com. Thanks for joining me on this #905 edition of ‘Gettin’ a li’l psycho on tyres. I hope you will join me again for Ferrari Friday tomorrow. Don’t forget to come back now ! 25/10/11 Egg on my face dept, reader Martin Christandl kindly informs me that Lord Marches car is actually a J6 model not the similar looking J4. Thanks Martin. If you spot any any other errors please do not hesitate to let me know. 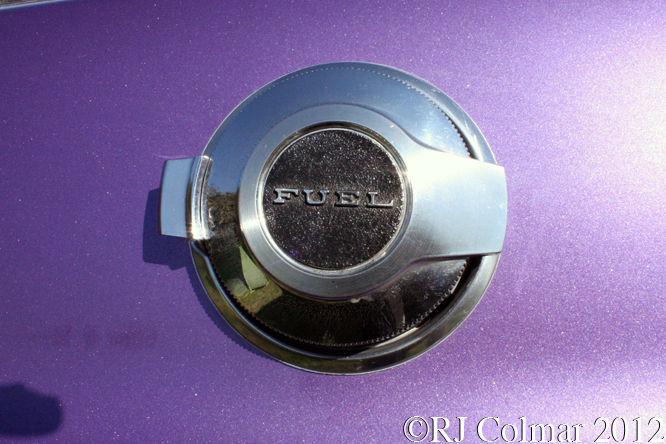 This entry was posted in Uncategorized and tagged California, Chuck, Colmar, Folsom, GALPOT, Goodwood, Grand, J4, James, Kellison, Manning, Ralph, Revival, Turismo on October 20, 2011 by Ralph.